Why was Council Pres. Pro-Tem Gary Brown (r) in this picture of Mayor Dave Bing announcing the EMA contract and the elimination of 81 percent of DWSD jobs? DETROIT — Council President Pro-Tem Gary Brown has been the chief Council member pressing for passage of the EMA contract, through the Public Health and Safety Committee which he chairs. During that committee’s hearing Nov. 19, many from the public asked who was paying Council members to sell off all of Detroit’s major assets. 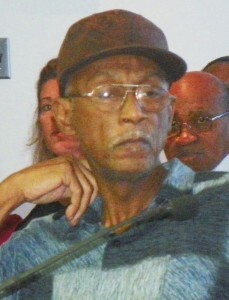 Tyrone Travis, Detroit activist since the 1960’s, member of Free Detroit-No Consent, and founding member of the Coallition to Stop Privatization and Save Our City, at earlier Council meeting. Aside from whatever secret dealings he has had as part of U.S. District Court Judge Sean Cox’s “Roots Cause Committee,” a review of Brown’s city council campaign finance documents shows strong connections with BOWC vice-chair James F. Thrower, and many Water Department contractors. 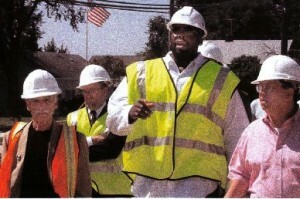 Former Mayor Kwame Kilpatrick (center) and former DWSD Director Victor Mercado, who has pleaded guilty to federal charges related to DWSD contracting, at the scene of the Macomb County sinkhole on 15 Mile in Sterling Heights in 2004, with contractors hired to repair the damage. 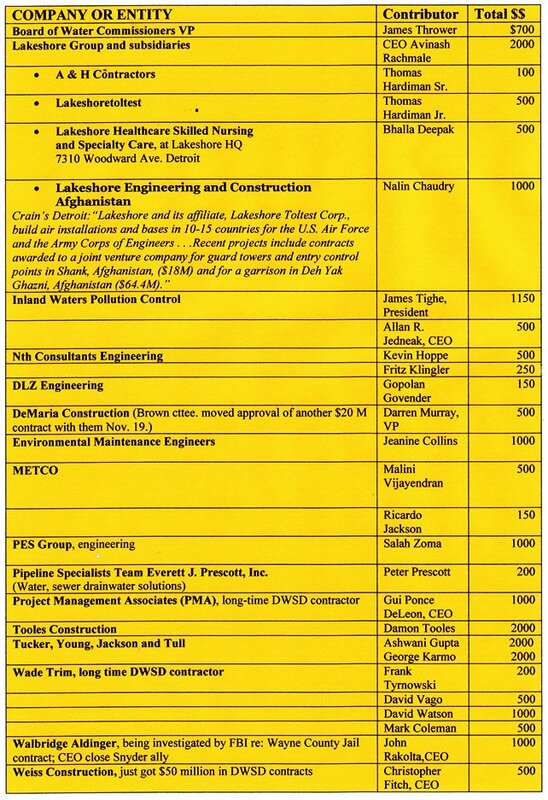 Most striking are the number of contributions from executives associated with the Lakeshore Group, Inland Waters Pollution Control, and Nth Consultants. They were all involved in the $50 million Macomb Interceptor sinkhole repair project which began in 2004, under the administration of former Mayor Kwame Kilpatrick. Macomb County sued Lakeshore Engineering and Inland Waters for alleged overbilling of $25 million on the project. The project is also tied to the federal criminal trial of Kilpatrick, his father Bernard Kilpatrick, and Bobby Ferguson, another DWSD contractor. A spokesperson for Lakeshore, Audrey Young, said however that Lakeshore had been dismissed from the lawsuit early on. VOD is still checking for court records on the case. Macomb County’s actions may have been directed to wrest control of DWSD from the City of Detroit, which they and Oakland County have partially done, with the compliance of Detroit Mayor Dave Bing, under a Feb. 2011 deal reached under Judge Sean Cox. 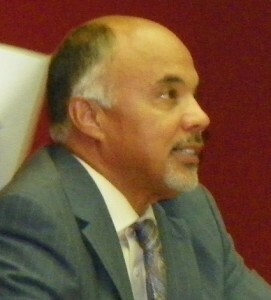 Gary Brown pushes for passage of EMA contract at City Council committee hearing Oct. 15, 2012. But nonetheless they raise questions about dirty dealings behind large-scale private contracting everywhere. Since he took office, contributions to Gary Brown from large-scale, mainly white-owned contractors who often do business with the Water Department, the Transportation Department and others have gone up dramatically, according to campaign finance reports which can now be accessed online at the Wayne County Clerk’s website at http://www.wccampaignfinance.com/. Many of these contracts come through his committee before going to Council. VOD looked at Brown’s reports submitted from 2009 to 2012, and pulled out contractors associated with the Detroit Water and Sewerage Department, as shown in the chart below. The list is likely not complete due to time constraints. VOD will also research Council President Charles Pugh’s contributions this week. Since this story was completed after-hours, Brown was not available for comment. But he owes the public which elected him an explanation at the Council meetings Nov. 20. GARY BROWN’S CAMPAIGN CONTRIBUTIONS, 2009-2012 FROM THOSE WITH FINANCIAL INTERESTS IN THE DETROIT WATER DEPARTMENT.